According to reports from the Ambergris Caye Marine Turtle Program, at the Hol Chan Marine Reserve, the 2017 turtle nesting season is looking bright. The month of August is the peak of the season, and so far a total of 94 nests have been found. 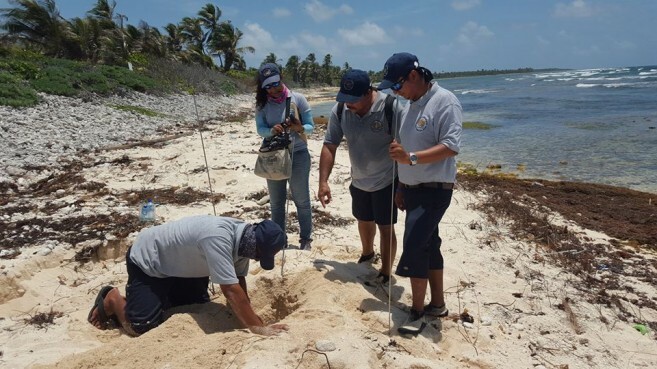 As personnel from the turtle program continue to monitor the activities on the nesting grounds, they once again ask the general public who occasionally frequent the nesting areas to be mindful, and leave nests undisturbed. This is not only important for the survival of baby turtles, but for adult turtles to continue returning year after year to these areas to nest. The nesting season runs from May to November each year. 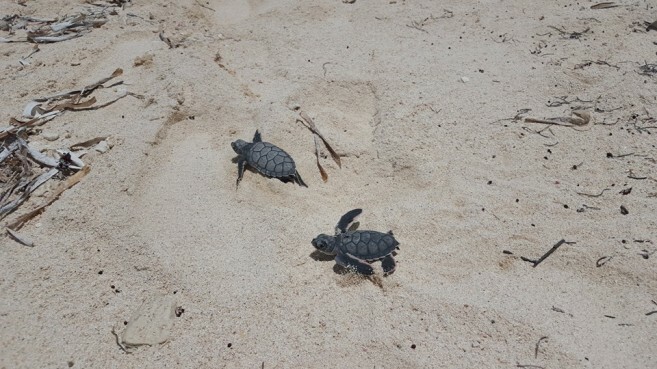 According to Kirah Forman, Marine Biologist at Hol Chan Marine Reserve, who spearheads the turtle program on the island, the nesting season is looking good better than last year. “Due to Hurricane Earl last year, most of the nests were lost. This year, the weather has been more favourable, and about 35 nests from the 94 found have successfully hatched,” said Foreman. She stated that so far, only one nest was affected due to the effects of Tropical Storm Franklin earlier this month. The majority of the nests have been located in the Robles Point, Rocky Point area around Basil Jones. Forman indicated that at the beginning of the season this year, and leading to its peak in August, it was mainly the Loggerhead turtles who first crawled to shore to lay their eggs. “At this time nearing September is when we see the Green turtles making their way to beach to lay their eggs,” she said. “The number of nests will start to decrease as the season slowly winds down to its end in November.” Foreman says that hatching survival depends on the changes of the weather, environmental challenges and of course, human interference. The current nesting areas are public beaches accessible by island residents. The presence of persons visiting these areas, especially on weekends, is visible via the garbage and other objects left behind. This could deter turtles from continuing to nest in the area. “This has been a favourite spot for turtles [to nest],” said Forman. “The beach is accessible to everyone; nobody is prohibited to visit. 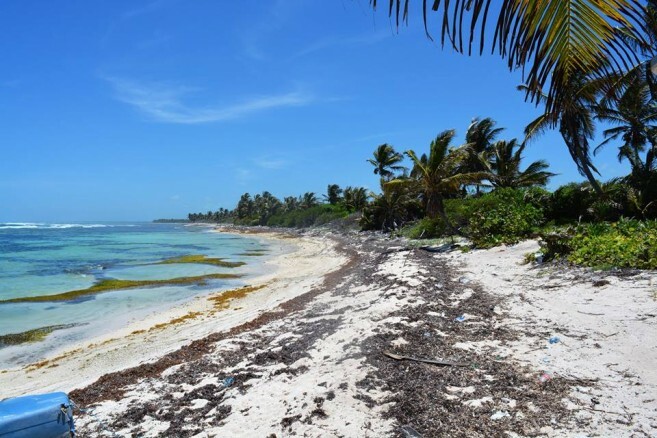 However, they need to pay attention that it is a turtle nesting area and we need to take care of it.” Many islanders visit the area in order to escape the hustle and bustle of town. It is said that golf carts are driving over the nests. People drink, cook on the beach, and leave lots of garbage behind. Forman admits that there is no signage along the beach, however, visitors should be more mindful and know by now that it is a very sensitive area that needs to be taken care of by everyone. The public is also asked that when visiting at night to turn off any bright lights. Nearby residents/establishments are asked to limit beach lighting, as hatching turtles tend to orient themselves with light as they make their way to the sea. Hol Chan Marine Reserve is encouraging everyone on the northern coastline to please exercise caution when traveling via motorized vehicles along the beach. Sea turtles are ecologically important and have great significance to the Belize’s tourism industry. Please do not disturb anything that you suspect is a turtle nest. Report all suspected nests or sea turtle crawls to the Hol Chan Marine Reserve office at 226-2247.